Roots: Reincarnation beliefs. The Doctor quotes Hamlet and the Bible. Technobabble: To realign the TARDIS's synchronic multiloop stabiliser, it is necessary to activate the analogue osmosis dampener. Continuity: The Repulsion is an entity that inhabits a dimension "between death and life" [a region of N-Space (The Ghost of N-Space)?]. It is known to the Arboretans, who describe it as "unfettered evil". The Repulsion uses the time-distortion created by the Necroport to gain access to the real world. Needing physical form, it takes the survivors of the Cerberus from 2815 and sends them to the year 3012 via its own dimension, replacing the zombies it created in the year 3012 with them in order to act as vessels for its life force. It is only able to control the zombies by remote control, whereas the possessed passengers contain actual elements of its consciousness. Possession by the Repulsion results in black oily slime filling the mouths and eyes of its victims. When the Repulsion tries to possess the Doctor, he tricks it into possessing K-9 and then downloads it into the mind of ERIC, the senile and suicidal computer on the G-Lock, which he then helps to die, thus destroying the Repulsion. Arboreta has a twin planet covered entirely by ocean. Vast creatures called Leviathans inhabit it. Its inhabitants are plant-like humanoids with a unique relationship to time - at the point of death, their consciousness travels back to the point of their birth, and they live their life over again. Gallura says that they have lived an infinity of lives and will live an infinity more. Despite this, although they are can make minor changes to the paths of their lives, they cannot make major changes, such as averting their genocide. They attempt to reach their maximum potential in each life, a calling that they refer to as "the path of perfection". Somehow learning of the Arboretans' secret, Paddox arrived on Arboreta and for the next twenty years slaughtered thousands of Arboretans for the sake of his research, trying to find out how their secret works so that he can travel back in time and prevent the deaths of his parents. Eventually, his experiments reduced the surface of Arboreta to ashes and he shipped the surviving Arboretans to the G-Lock to complete his research. The Arboretans are harnessed to the Necroport and used as psychotemporal conduits, or mediums, to grant the participants in the Beautiful Death access to the afterlife. The Necroport is designed to allow Paddox to be reincarnated and stop his parents from dying. Since the ability to alter history is specific only to certain species that partially exist outside of time, such as the Arboretans and the Time Lords, Paddox condemns himself to an eternity of reliving his life over and over, able to witness his past mistakes but unable to change them. The Beautiful Death is supposedly designed to allow subjects to experience the afterlife without remaining dead, thanks to the power of the Necroport. In fact, the Beautiful Death is the power source of the Necroport, draining the psychothermic energy released from living creatures at the point of death from the participants and storing it. The bodies of the customers need to be frozen to prevent decomposition, and have to be reawakened after thirty minutes, or the process is irreversible. Forty-one customers failed to recover prior to the Repulsion's attack, and remained in its Domain. Arachnopods are bio-engineered arthropods with voracious appetites. They are widely (and incorrectly) considered indestructible and can detach and replace their limbs, reassembling themselves after injury. They were presumably created as a weapon, although those present on the Montressor are being transported to a prison planet suggesting that they have run amok. They have limited intelligence and can speak, although their dialogue tends to be limited to "must have eats!". In the absence of other food, they will eat each other. The Doctor failed his Time Travel Proficiency test at the Academy because he didn't turn up for it. Romana is attempting to persuade him to retake it, since without it Time Lords are not qualified to operate TARDISes. The Continuum Code contains the theory needed for the exam, and the practical exam includes emergency materialisation. K9 estimates that the probability of the Doctor achieving a satisfactory score is 0.1 percent. He carries in his pocket a copy of Bor Pollag's Book of Alien Monsters, which includes illustrated entries on Akker-Takkers, Algolian Sithersbacks, Apostles of Grarb, and the Arachnopods. The Doctor uses the TARDIS to follow Romana's time trail. The Doctor and Romana pretend to be from Intergalactic Espionage. Unusually, the TARDIS arrives on the G-Lock after the Doctor, Romana and K-9 have already won, giving them knowledge of what they did/will do. Species that visit the G-Lock other than humans include the Yetraxxi and Gonzies. Gonzies are a race of short, orange-skinned reptilian humanoids from the planet Gonzos. The term pre-ja vu means the sensation that one is going to have been somewhere before. It applies exclusively to Time Lords and was coined by the Academi Plurix. Illegal narcotics used by Hoopy and his friends include Glycerat, Novovacuous, Phenyzide, Etheramyl, Opiasamin, Tutranol, They drink Old Bizzarre. The co-pilot of the Montressor reads Shrieking Boy Veepjill - The Myth Behind the Truth - An Autobiography. Magazines available in the year 3012 include Guards and Guarding and Holding Captive. Location: The G-lock, trapped in a hyperspace tunnel between Teredekethon and Murgatroyd, 2815 and 3012. Future History: The theory of hyperspace tunnels dates back to the early twenty-second century. Intersystem shuttle flights are routine, and by 3012 there are Earth colonies called Third Birmingham and Nudism Four. The G-lock was formed when the luxury cruiser Cerberus became trapped whilst leaving hyperspace in the year 2815. The authorities sealed off the tunnel, trapping the Cerberus and the other ships behind it, including the prison transport Montressor. When the tunnel was reopened two months later and the emergency services sent in, all of the ships were deserted. This became known as the Mystery of the Cerberus. After the tunnel was reopened, the wrecks became a haven for dropouts, and eventual became a space station, i.e. the G-Lock (short for gridlock). In fact, the Arachnopods ate most of the occupants of the ships, and the rest were taken to the year 3012 by the Repulsion. Following the defeat of the Repulsion in 3012, a build-up of geostatic pressure caused by the interstitial reality allowing access to the Repulsion's domain, results in a loss of hyperspacial viability, resulting in the collapse of the tunnel and the destruction of the G-lock. Unrecorded Adventures: The Doctor has met General Custer. The Bottom Line: A straightforward plot is made wonderfully refreshing by the non-linear story telling, and Morris captures the regulars perfectly. Much use is made of wit, capturing the better qualities of Season Seventeen in the same way that Gareth Roberts did in his Virgin Fourth Doctor Missing Adventures. 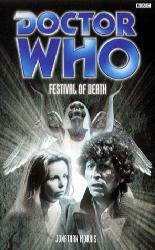 A triumph in its own right, and arguably the finest BBC Past Doctor Adventure to date.